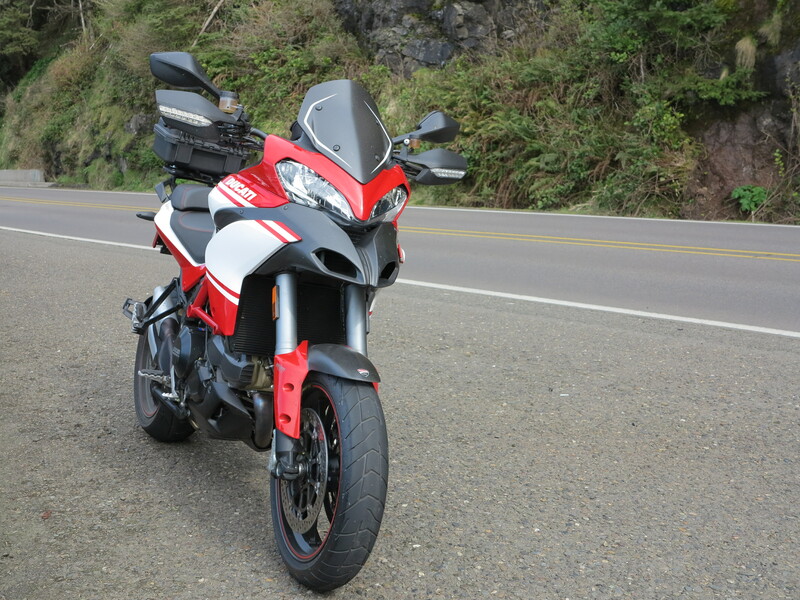 Each time I take the Multistrada out for a ride I like it better. After the first set of rides I reported here I have taken my Multistrada out another three times and I have also ridden my Triumph 800XC for a short burst and the new water cooled BMW 1200 GS as well (report on that ride soon). The BMW and the Triumph are excellent motorcycles, but the Multistrada is different… it is on another league in terms of performance. And I’m really feeling at home with it. Worse yet, I’m starting to think it really is a beautiful motorcycle as well. Am I getting my senses impaired? 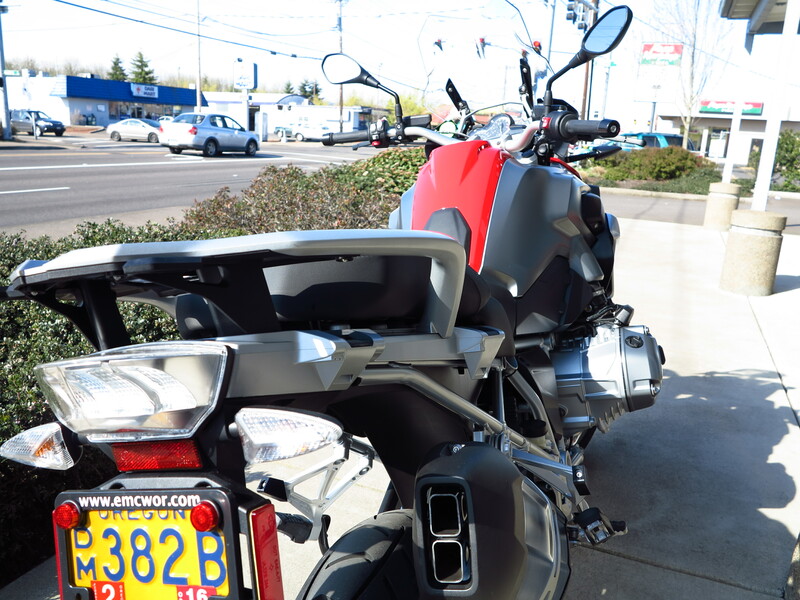 I scheduled March 30th for the first service of the Multistrada with the folks at EMCWOR. Now I need to add miles, a total of about 620 miles for the first service, which will complete the first phase of the break in process for the motor. This time of the year it could have been raining a lot more, but it has been unusually cold and dry for this corner of the world and for this time of the year. A few good days showed up and I took the bike out on rides to make the miles. 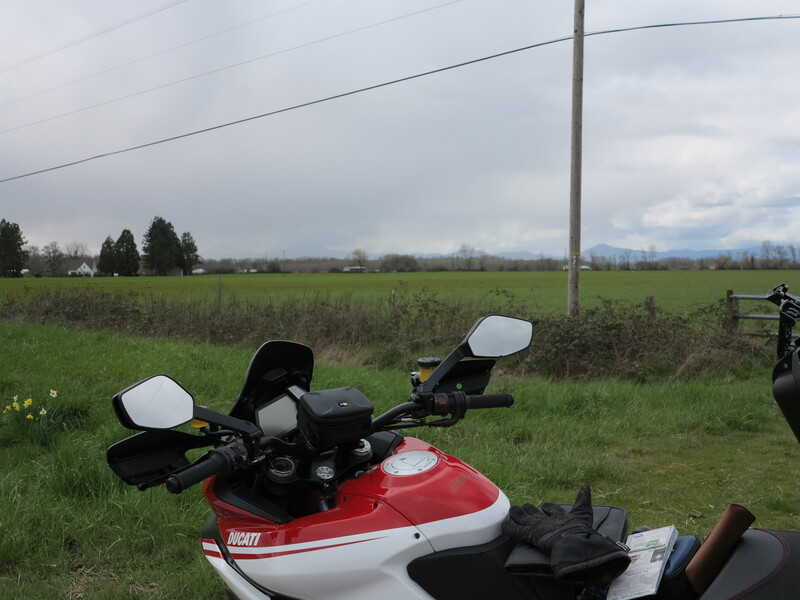 I first took it to Briggs Road, one of my favorite locations around the Eugene area. Soon we will see green on these vines, another life cycle starts. 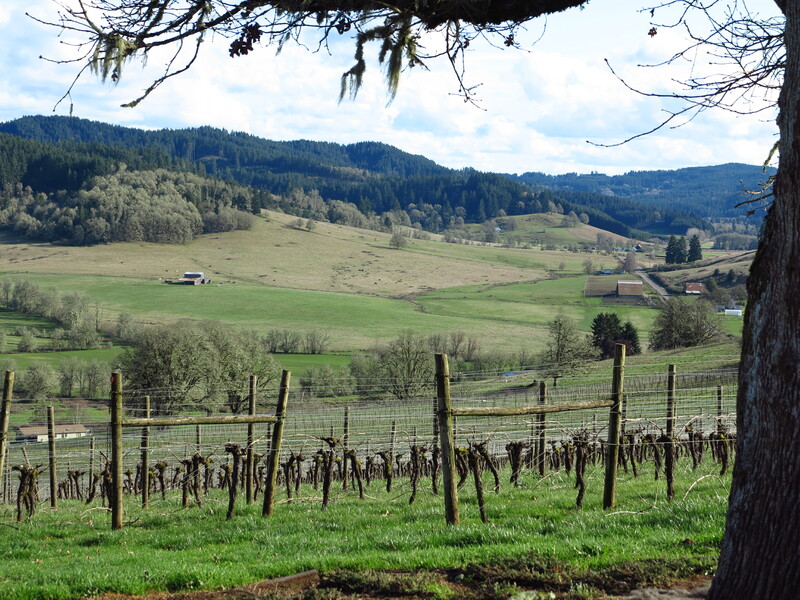 Hoping here for another great summer for the Oregon wine industry. Meanwhile, I am really appreciating how this bike is coming along. Definitely there is only one fueling setting acceptable: 150hp High. That is the one setting that gives you the most power and delivers it smoothly but strongly from just a slight twist of the throttle. For my personal taste this is one of the characteristics that makes this bike special. I know I’m not alone on this one. That was a short ride, some 40 miles or so. I took it back home and installed the Pelican case I had ordered the week before. If you’ve read my posts from 2011 you probably came across the post where I discuss the Giant Loop bags, and you will know I think tank bags are perhaps the worst accessory ever invented for a motorcycle. 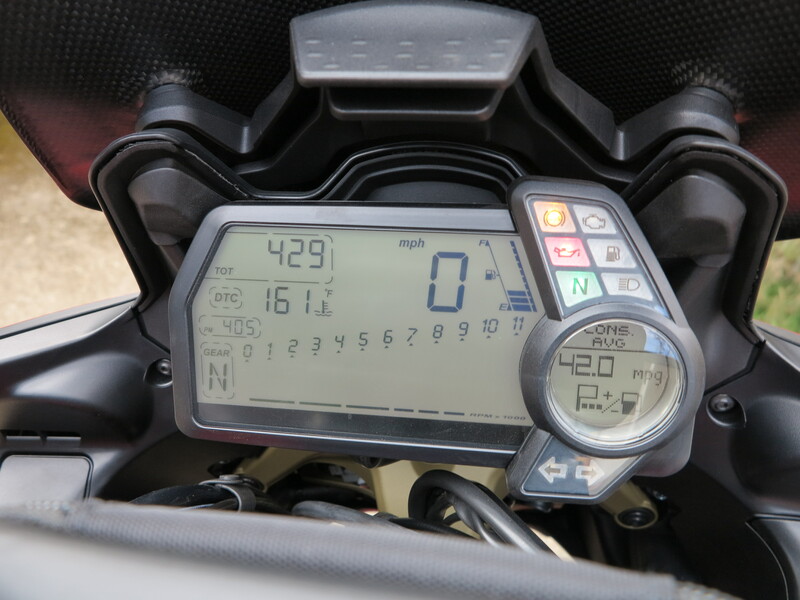 Although very practical, tank bags disrupt a critical element on the bike’s design, the tank, and it may impede your body movement on the bike as well as visibility to the instrument panel. Actually, anything attached to a motorcycle is a bad idea in my opinion. Including the extra weight and when space is made available, you carry more things. But you need to carry something, especially on longer riders, so a compromise needs to be reached. 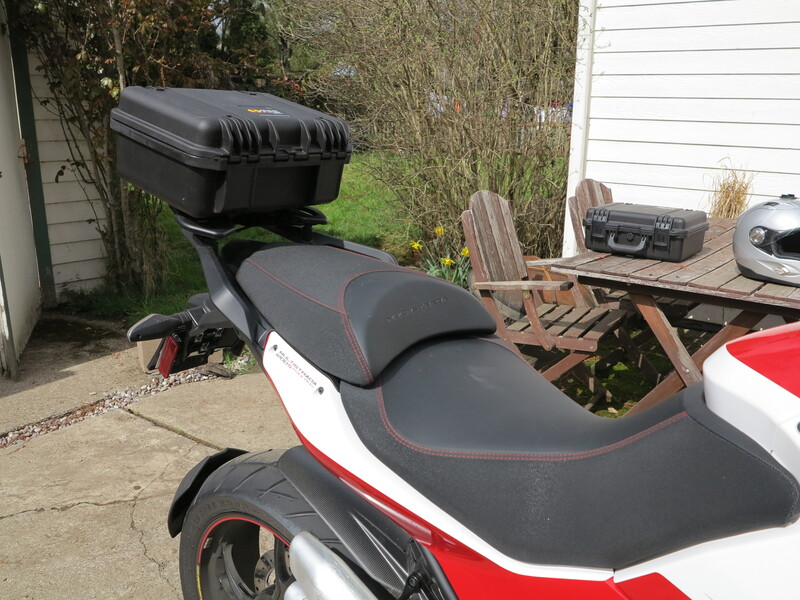 For the Multistrada I have the camera box in the handlebars, a minor nuisance, the Pelican case on the back, a slightly larger nuisance, and the Ducati side cases, a bigger nuisance. 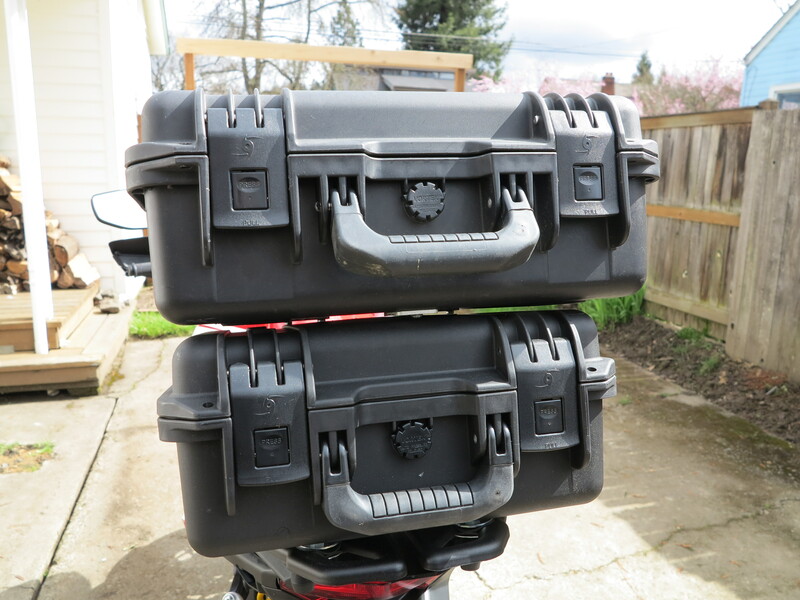 The side cases are for overnight trips, so they will stay off the bike most of the time. This pelican case is smaller than the one I have in my Triumph (Pelican iM2200 in the Triumph). The iM2100 is the right size to fit my computer, cameras, snacks and other small items. Tools and tire plugs fit under the seat. 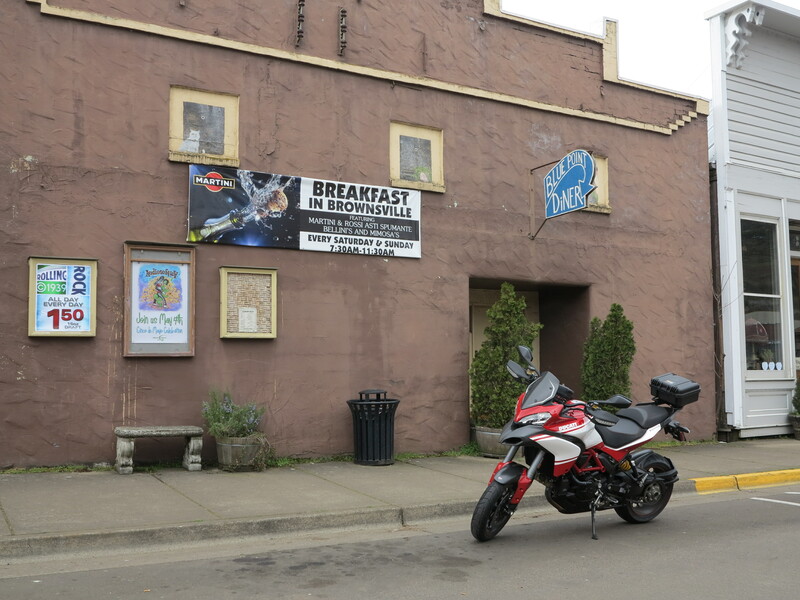 Sunday March 17th turned to be another good enough day for a ride, the sun was out, a bit timid but it was there, so I took off towards Brownsville, the Castlerock town of “Stand by Me”, the movie filmed here in Oregon based on Stephen King’s “The Body” novel. It is a great story and I have written a post about the film and about Brownsville here already. Besides its connection to the film, Brownsville has other things going for it. One of them is the Marcola Road to Brush Creek road I take to get to 228, arriving in Brownsville from the east. Once you get out of the Springfield urban area on Hwy 126, you go north on Marcola Rd, the first part is not too interesting, but soon after you go past the covered bridge you get into a nice set of curves with elevation changes on a forested area and later the curves are in more flat fields, with full view of where you need to go, what you need to do. This is a fun road, my friends. Eventually you get to 228 and from there you arrive in Brownsville, make a right on the main road and you get to the steel bridge with a view of the old downtown. 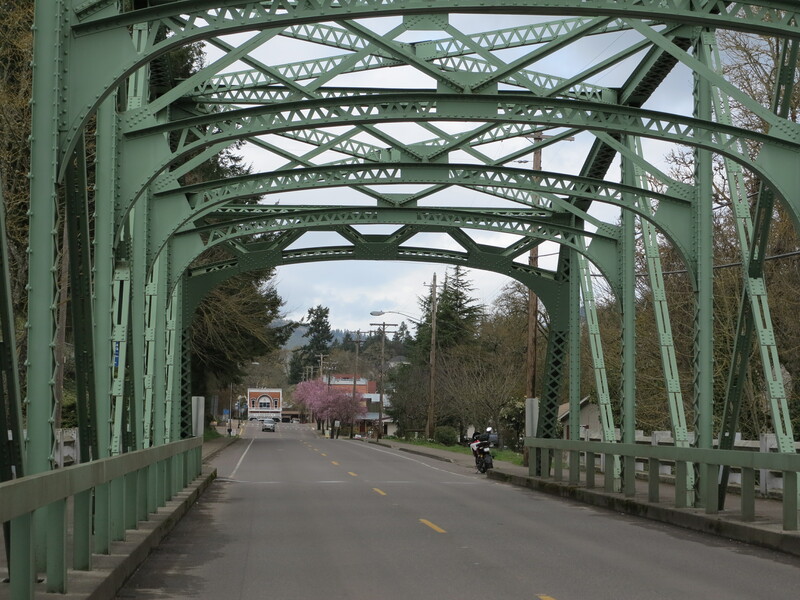 This steel bridge (below) is part of one of the last scenes of the movie, when the four boys cross it on foot, on their way back to town, a final chapter on that adventure. And that building on the background, with the arch windows, is the background of one of the first scenes, when the main protagonist is walking across town describing Castlerock. Background of first scenes of Stand by Me. Brownsville also has a reputation for its breakfast/brunch restaurant, or so I’ve heard. I have not tried this feature yet, but will soon. Blue Point Diner is also featured in the film, by the way. And my dentist, also a rider, told me about this museum, so I decided to take a closer look. I parked the bike in front of the museum and took my time getting my helmet out, putting my gloves in the box, taking pictures. When I get inside the two ladies working there were admiring my bike. The older one made a comment about it, saying she had seen advertisements about this bike. I don’t watch TV, so I don’t know where else this bike may have been advertized outside of motorcycle magazines. I was a bit unsure she really knew what this bike was. But this lady turns out to be quite a connoisseur of vehicles and mechanical things. Her husband (or was it her father?) used to work on Studebaker cars. And it so happen this museum has the grandaddy of all Studebakers, in the form of a Studebaker Wagon, a real wagon that has made the cross of the mid-plains and the Rockies from Independence (Missouri river) to Oregon, arriving in the Willamette valley in the fall of 1865. 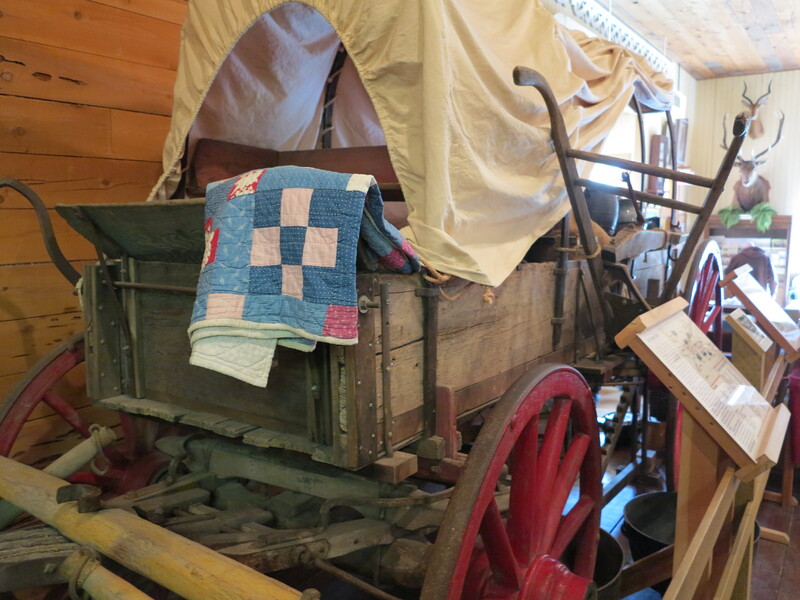 If you want to know details about this wagon I recommend you visit this museum. The friendly lady working there will let you know in detail the workings of this wagon, the capabilities of this wagon, and how these trips were organized those days. She will also let you know the advantages of the Studebaker vis-a-vis the Canistoga (another brand of Wagon of those days). Something like a Ford and Chevy, Apple and PC of those days, I think. And this museum has a lot more to offer than this wagon. 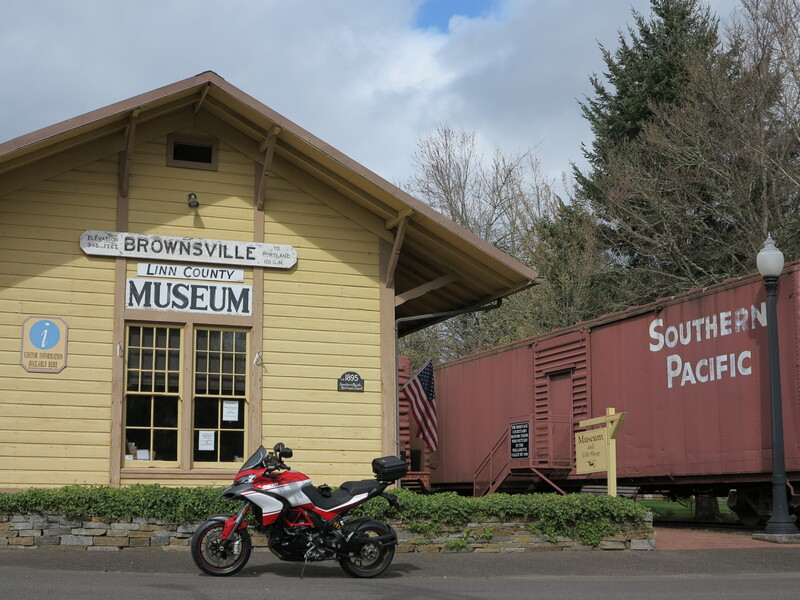 Brownsville is worth a trip, especially if you have the breakfast (although I should not advertise something I didn’t do), the curiosity about the town as the “Stand by Me” location, the nice roads getting there and the museum. As I was getting ready to leave, the younger lady advised me about the rain. Yes, the sky was turning dark, so I took off towards home, took 228 straight west towards Hwy 99 and went south from there. I stopped to photograph the dark skies and the rain when I noticed water dripping from the Pelican case. My water bottle opened and flooded the case… Luckily nothing got damaged (I had another camera in there, a map, and other things). Lesson learned. And it turned out the rain did not last, so all was good. I made it home dry. The bike had 429 miles at this point. The following Sunday I took it out for another ride. Her sisters observed closely. Since I had about 200 miles to go to complete the 620 miles for the first service, I decided to go check the Pacific. It was a very nice day, almost no wind, waves were 5ft with 11 second intervals earlier. Perfect for surfing. 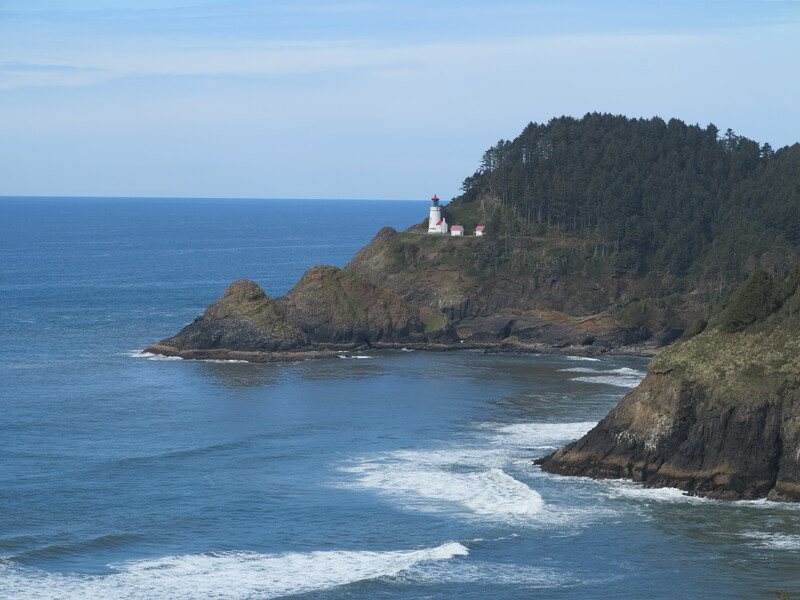 I stopped by the Heceta Lighthouse, finally I could see the result of the renovation. It looks great, too clean as a matter of fact, it looks like a toy. That was it, I turned around and came back home. By the time I made it home she was ready for her first service. Yesterday (Saturday, March 30th) I took her in for her service at the EMCWOR. While I waited for her to get ready I found this machine sitting outside, ready to be taken for a test ride. 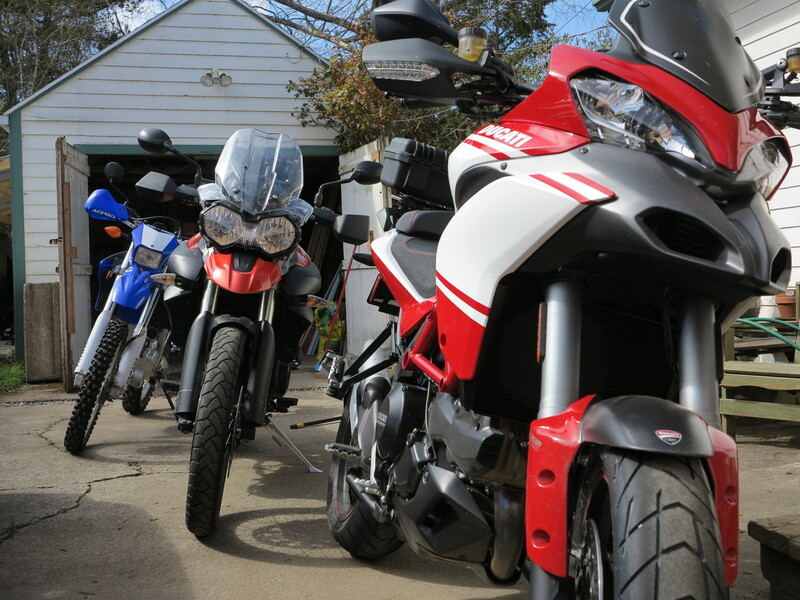 I collected the Multistrada and brought it home. I’m glad this time my bike felt better than the one I tested on my way home, first time ever, although the 2013 BMW 1200 GS has many improvements from the previous model. It is worth a test if you have an older GS model or you want to see what a GS is all about. This bike will not disappoint you. Check my next post where I will report my ride on this excellent machine. The multistrada is becoming very photogenic. Or is it that you are very good with a camera!! I hope you managed to get out in our 70˚ weather this last weekend. Thank you for saying this about the bike, Trobairitz. I think the bike is not bad looking after all. I took it out last Saturday, but it was a very short ride – that was the day it was being serviced. I did ride the new GS on that day, and later my Tiger, on that same day. I guess we are both biased, then. I’m starting to think this bike looks really sharp. Thanks for the link, I see your set up with the small case. I thought about the Pelican 1400, like yours, I like it that it is smaller. But in the end my computer needed to fit inside of it with its sleeve, that’s why the iM2100. These cases are really strong, waterproof, and they are a bargain. Hope you don’t have snow on the ground anymore. Around here the situation is improving. It will rain in the next weekend, but it soon will get really good for riding every weekend! 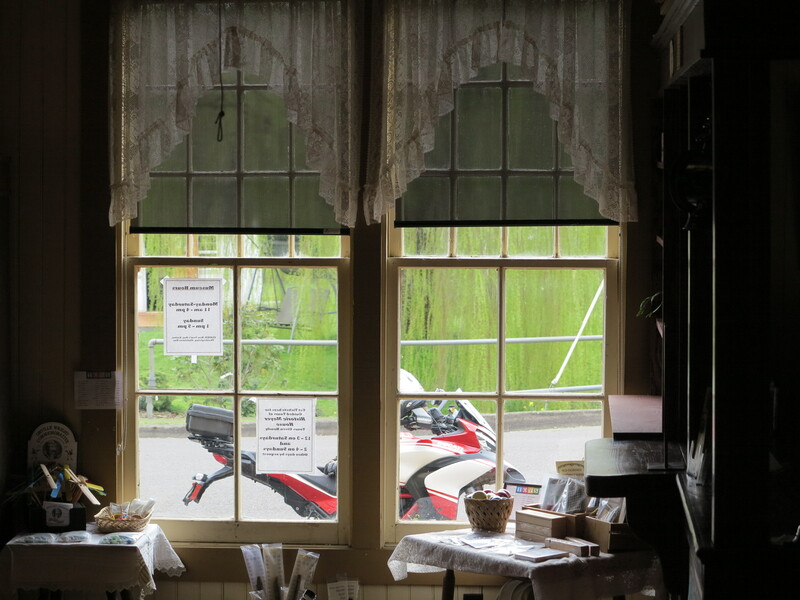 Your bike is a rolling work of beauty and I like the way you pose in front of diners and through the window. It’s hard to imagine how much power you have available. Thanks Bob, she gets more and more beautiful in my eyes as days pass. And yes, lots of power… good for bursts of power for passing motorhomes on 101. 🙂 Of course, always being extra careful here. I already have some plans for longer trips to different places in the state this coming summer. Looking forward to it. Hi Cesar, Congratulations with your beautiful website. Could you please compare the 2013 Multistrada with the new LC BMW R1200GS? I’m seriously thinking buying one of these. It is coming up. I just rode it two weeks ago, writing it now. Two great bikes! Information will be posted in a couple of days. Cesar, I have been reading your blog but it is not very clear to me why you have sold your SF848. I also had the SF848 and I sold it again to buy a 999S with very low mileage. Somehow I did not like the SF848: quite agressive and not completely my style. Now I’m thinking about buying the 2013 Multistrada because I want a more practical bike again (therefore I’m also thinking about buying the R1200GS LC). I prefer Ducati and I would go for the base Multistrada version without skyhook suspension. Have you experience with the normal suspension? How does the MTS compare to the SF848? 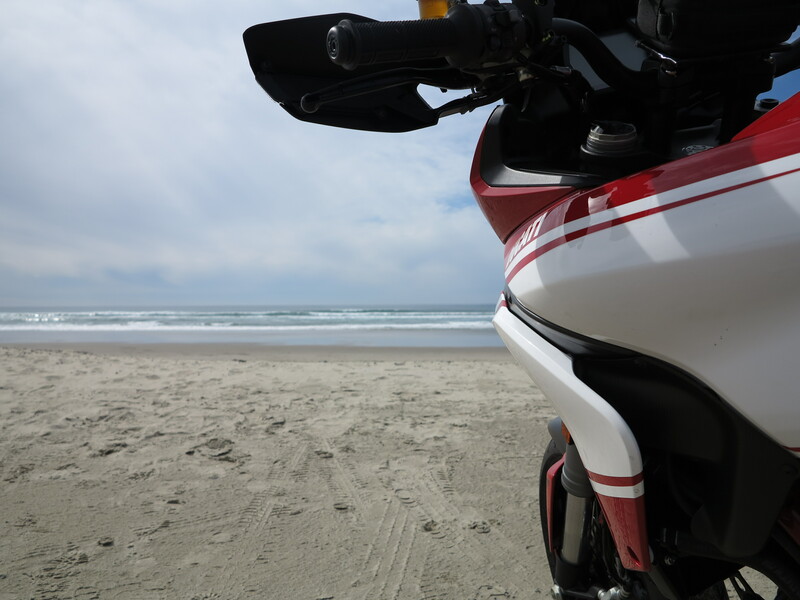 Well, I really liked the SF848, but it was not a practical bike. 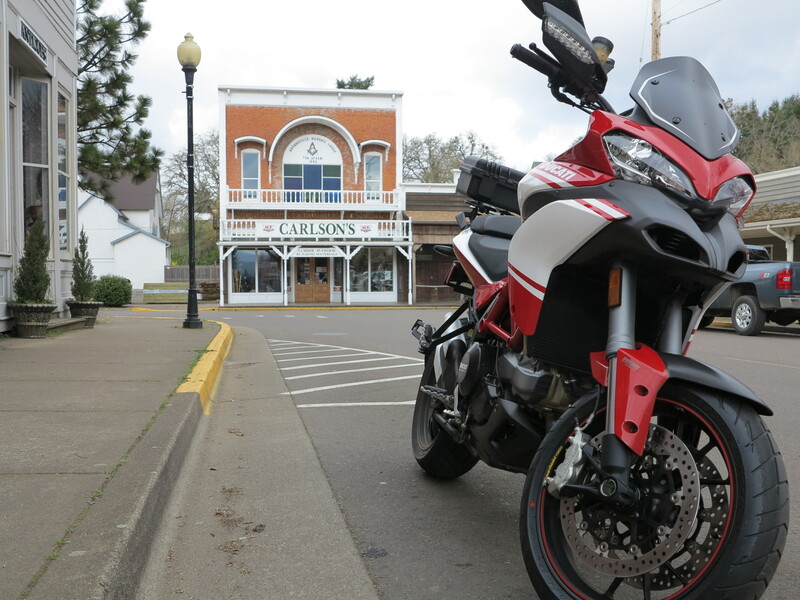 I figured with the Multistrada I could get the Ducati experience, I like its aggressive power delivery the most, but on a more practical package, one that I could use to travel longer distances. The SF848 as, well is, an amazing motorcycle. I liked it for riding at the 6-8,000 rpm range. That’s when it was the greatest. 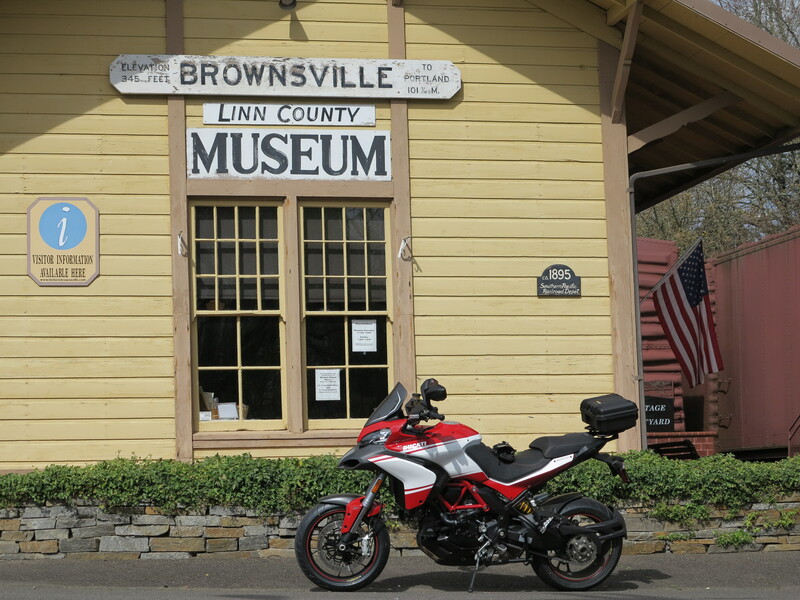 The Multistrada gives me that, and also lets me cruise when I want to just enjoy the sites. 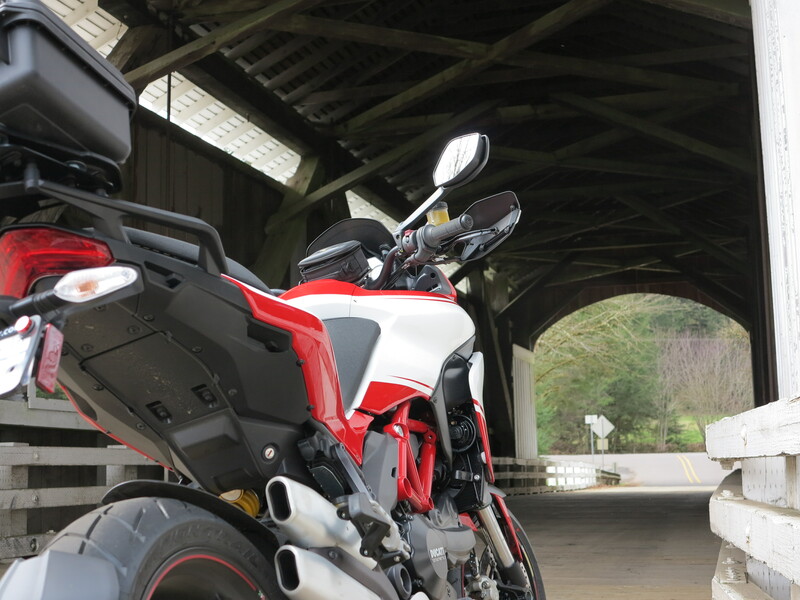 Plus I can carry my bags and go for an overnight trip somewhere on the Multistrada. Also, I was considering my other bikes. I want my Triumph Tiger to become more dirt/gravel ready. So the SF848 would be my only real road bike. That was not going to work because of the aforementioned characteristics. If I could afford four motorcycles, I would have kept the SF848. I miss it for what it could deliver best. And it looked so great!